You can tell a lot from going to the toilet – especially from urine. Urine can take on many shades and hues, but this is not always a good thing. It can take the colour of the food we eat, the vitamins that we take and can be dark or light. What does all this mean? Is rainbow coloured pee actually a good thing? The infographic below shows how pee can be a useful diagnostic tool. So what does red or green pee mean? It could mean that you just had some beets earlier in the day or it could be a sign of disease. Bright yellow pee could mean that your body is getting rid of excess vitamin B supplements. If in doubt, always see a practitioner or doctor. Now that you have reviewed the above chart, you are probably trying to remember what your last urine looked like or have gone to the washroom to check. 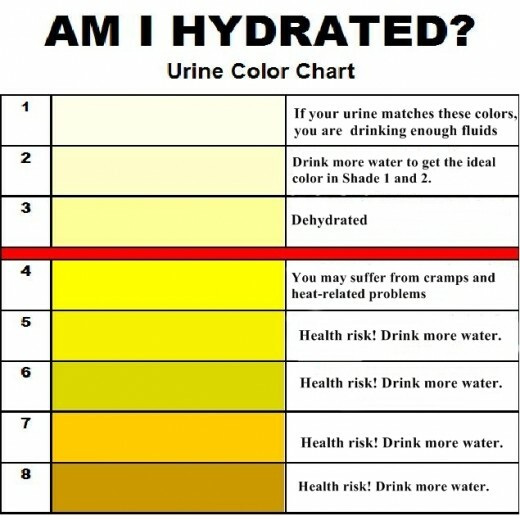 If your urine is a pale or light yellow then it means you are hydrated. If it is very clear and transparent then you probably had too much water. The darker it gets the more dehydrated the body is. Dehydration could lead to muscle cramping or lack of body temperature control, but extreme dehydration could lead to dizziness, rapid heartbeat, shock and even death. Urine can also indicate whether or not you are at risk of diabetes and can also be used to test your B12 levels. It is also used to diagnose kidney or urinary tract infections and can also indicate pregnancy. Don’t take the risk – stay hydrated by drinking plenty of fluids and eating fruits and veggies that also contain water. Hydration is key to healthy skin other body functions. Stay hydrated this summer and don’t put your body at risk.